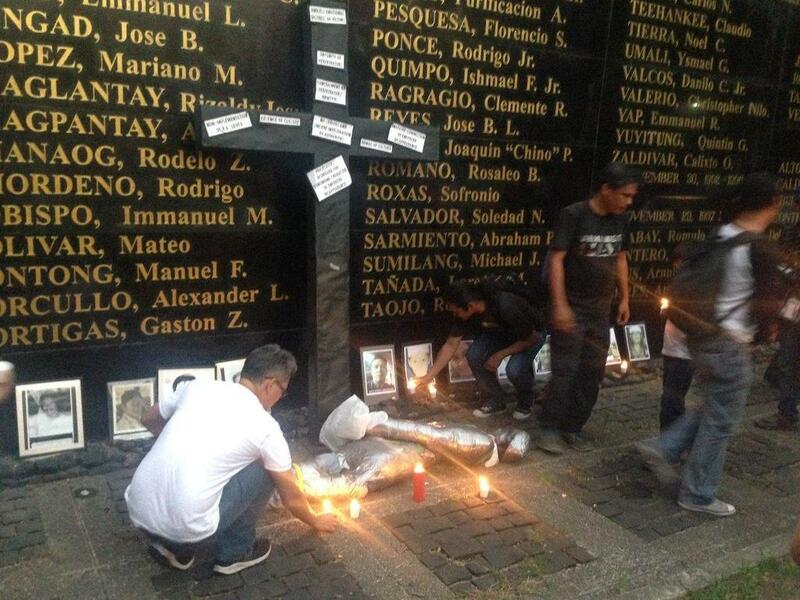 The families of victims of abuses during the Martial Law Regime and those who have been slain in alleged extrajudicial killings made sure to remember them during the Holy Week. On Wednesday, they gathered for Kalbaryo ng Kawalan ng Karapatan held at the Bantayog ng mga Bayani in Quezon City. “Hindi ibabaon sa limot ang mga buhay na inalay para lang ang Inang Bayan ay mapalayang higit,” one of them said during the program. The mourning families were supported by members of various human rights foundations such as iDEFEND and Asian Federation Against Disappearance (AFAD), who organized the event. Aside from the program, iDEFEND and AFAD also arranged meetings among the families of Martial Law victims and families of those killed in the war on drugs. A psychologist will be facilitating the meetings. The human rights defenders raised concerns over the increasing number of alleged extrajudicial killings in the country. Nissa Concepcion from iDEFEND said that they were at a loss as to how to raise awareness about the victims of human rights abuses. “At this time, there’s a huge lack of concern. There’s a huge apathy in society,” Concepcion said. “I don’t know what other means we can employ to create awareness and sympathy for the victims,” she added. This was an effort to provide support system to the families, help them decide what to do and where to go, Concepcion said. “We want to show support first of all…and tell that they are not alone, that it has happened before to other families especially yung disappearances,” she said.